Calcium carbide is an inorganic compound with the following primary commercial applications: generation of acetylene, production of calcium cyanamide (a nitrogen fertilizer), and use in the iron (foundry) and steel industries as a desulfurization reagent in the production of ductile iron and steel and as a slag modifier/conditioner (reducer) in steel production. In the United States, Japan, and China, the largest end use is the production of acetylene, both for cutting and welding and for chemicals. In Europe, metallurgical use and calcium cyanamide each have a share of over 36% of the market for calcium carbide. China is the dominant player in the calcium carbide market, representing about 96% of total supply and consumption. Because of its large reserves and recent capacity rationalizations, and with the rapid development of chemical production, especially for the production of VCM, VAM, and BDO from acetylene, Chinese consumption of calcium carbide increased at an average rate of 8.5% per year between 2011 and 2016. During the next five years, calcium carbide will continue to play an important role as a raw material in the production of acetylene-based chemicals. Although China's economic growth may further moderate, it is expected that demand growth for calcium carbide will continue to sustain healthy rates. China is the world’s largest exporter of calcium carbide. The production of acetylene is the largest end use for calcium carbide, amounting to about 90% of total consumption in the major regions. China’s sizable share of the global calcium carbide market is linked to the country’s strong economic growth, large coal reserves, and ever-increasing acetylene demand for chemicals. Calcium carbide to PVC, considered an antiquated process in developed parts of the world, represents over 80% of China’s total PVC production. As a result of continued development, China is projected to experience just over 4% per year growth in the consumption of calcium carbide to 2021. 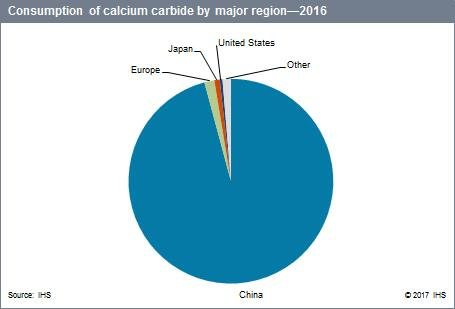 Although supply/demand for calcium carbide in some other regions/countries will increase in the future, the limited growth in volume will not change the world's supply/demand pattern in the forecast period. Japan is a small producer and consumer of calcium carbide. Japanese calcium carbide consumption is estimated to be mainly for acetylene production (87%); calcium cyanamide and use as a desulfurization reagent accounted for 8% and 5%, respectively, in 2016. Overall calcium carbide demand is expected to decrease slightly through 2021. In the United States, calcium carbide demand for acetylene in chemical applications, metallurgical uses, and industrial acetylene will show small increases.